Israeli Prime Minister Benjamin Netanyahu on Friday paid tribute to Holocaust victims and Lithuanians who saved Jews during a historic visit to the Baltic EU state, the homeland of his ancestors. In an emotional address at the Paneriai memorial on the outskirts of the capital Vilnius, Netanyahu recalled an anti-Semitic attack against his grandfather "not very far" from the site. 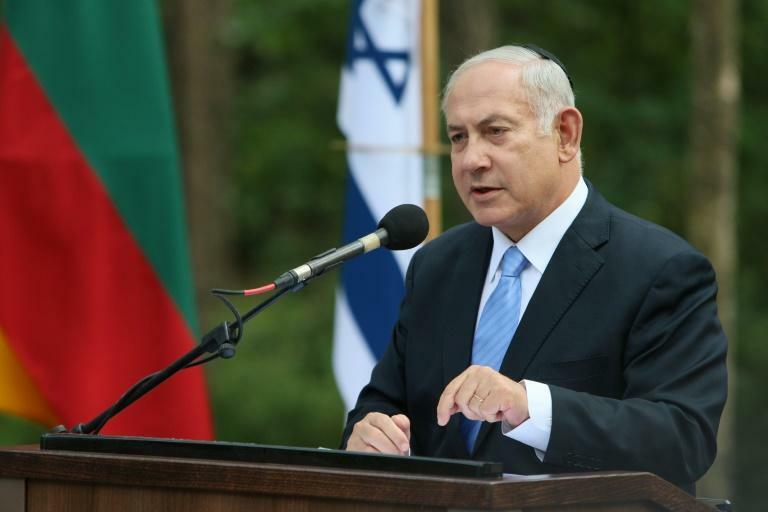 "I want to say to my grandfather today: Saba, I am back here in this forest of death as the prime minister of Israel," said Netanyahu, who is the first Israeli premier to visit Lithuania. "We will never be defenceless again. We have a state, we have an army and we are capable of defending ourselves by ourselves," he added. Netanyahu's forefathers left Lithuania before the Holocaust. Jews who stayed met a tragic fate: more than 90 percent of over 200,000 Lithuanian Jews died under German Nazi occupation from 1941 to 1944. The Israeli leader also posthumously awarded a Lithuanian family the title of Righteous among the Nations for having saved their Jewish neighbour from the Nazis by hiding them in the barn and tunnels under the garden during the war. But in the past, Lithuania has come under fire for being slow to openly acknowledge the role of Nazi collaborators. Prime Minister Saulius Skvernelis said Friday "the historical facts will never be hidden however painful they are." "I believe that we learned the lessons of the history," he said at the ceremony. The legacy of the Holocaust and close alignment with the US are among the reasons why Lithuania has become one of Israel's closest friends in the European Union. Earlier on Friday, Netanyahu asked Lithuania and fellow Baltic states for help in convincing the EU to step up pressure on Iran and slammed a Brussels aid package for Tehran.